The Megabass Megadog is a megasized topwater for those lunker hunters and big bait aficionados. This massive topwater comes in around the nine inch mark and about five ounces; no finesse here. When fish are busting on those big bait the Megadog is right at home. Molded with a wide flat bottom and a tapered tail that allows this big dog to easily slide back and forth across the surface when twitched with its head pointed slightly upwards perfect for cutting through any chop. Armed with a patented double inertial balancer system as well, the Megabass Megadog not only generates a loud knocking sound but also remains perfectly balanced for a superior walking action under any condition. While large the Megadog walks with ease and little resistance making it feel light and as if it were an average topwater but it's not by any means. Armed with heavy duty components all around, the Megabass Megadog is equipped extra-strong razor sharp treble hooks that are attached by double stainless steel split ring and swiveling hook hangers to ensure maximum hook-up and landing ratios. 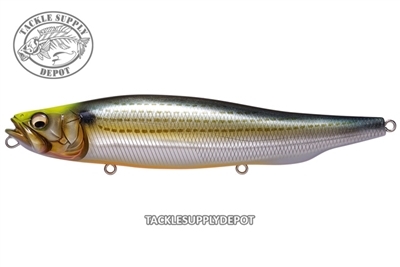 This bait is a must have if you're a big bait freak.